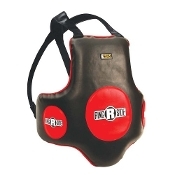 Complete coverage of the upper torso allows the coach to safely incorporate body shots into Punch Mitt routines. Gel Shock padding aids in dispersing shock before it reaches the body. Durable synthetic leather construction.